Processing charges are not included on lists created on the website. In order to determine what charges are incurred with the non-standard options that your library has selected, a quote will need to be requested to include this information (see requesting a quote). We have added an 856 tag to all our MARC records that links to a full-color cover image of the title. You can view book covers right from your circulation system — at no cost to you. This will affect all new MARC records you obtain from Mackin. If you want to add the BookLook link to your existing MARC records, we can also do that for you! There is a charge of $149 for that service. Contact Customer Service to request this: 800.245.9540 or customerservice@mackin.com. Standard cataloging and processing is a free Mackin service. Standard processing includes a barcode, spine label, MARC record, a mylar cover on jacketed books, and a reading program label (if applicable to your school). If your school requires additional items such as theft protection, a second barcode, stamping, etc. there are minimal charges for these items. Your exact specifications are kept on file so that we catalog and process your orders accurately every time. NOTE: Once you submit your specifications, you do not have to re-submit them again for future orders (unless you want to change something on your specs). Email – Records will be delivered as an attachment to the shipment notification. Download – The shipment notification will indicate that records are available for download from our website. Please Note: If you choose email, you will also have the ability to download MARC records from our website. To download your MARC records, log into Mackin.com and go to My Account > Orders. Select the Download MARC Records link associated with the desired order/invoice and follow the instructions. For records received by email, please save the MARC file to your desktop. DO NOT open the file as you will be unable to view the records without the proper MARC record utility. Once the records are saved, use the import program for your software to ingest the records into your system. For specific procedures on importing MARC records with your particular software, consult the manual or software representative. Mackin offers several processing options outside of the free standard cataloging and processing we provide. We can apply your school’s unique property stamp in any location you choose. We also apply any type of theft-detection device including nonprint theft detection used with 3M security systems. Paperback books can be covered with Colibri or Kapco easy covers. Alternately, you can take advantage of our special MackinBound hardcovers. 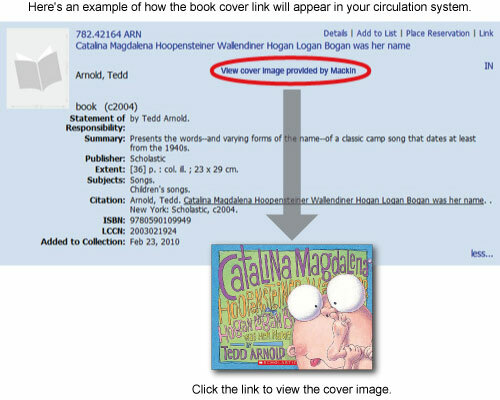 If you would like to add cover images to your existing MARC records, check out BookLook. At times there may be materials that require processing outside of standard library processing (classroom sets, professional materials, etc.). For these items, you will need to indicate that these materials require special handling, since our standard is to always use the cataloging and processing specifications on file unless requested otherwise. For orders online, check Yes next to Catalog and process this order. 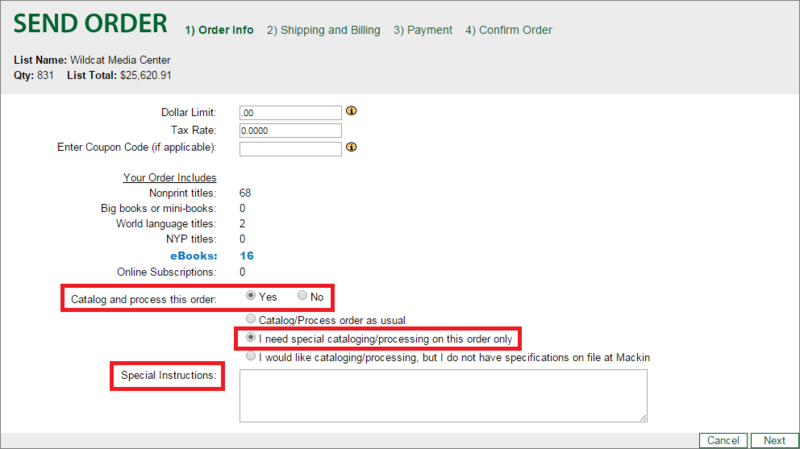 Select the button labeled I need special cataloging/processing on this order only. Finally, detail what special cataloging is needed in the Special Instructions box. For orders submitted in other ways, please note on the order the special processing you require. If you would like orders cataloged and processed, we need your specifications on file at Mackin. They can be faxed, mailed, completed online, emailed or given to a customer service representative over the phone. To complete your specifications online, go to our Cataloging and Processing form. You can find a link to this form on our Processing and Cataloging webpage. 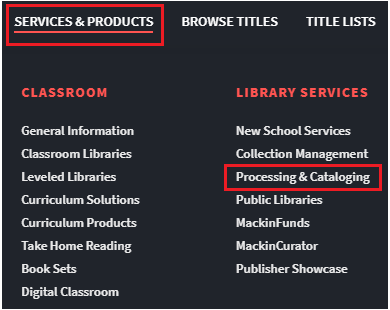 From the Home page, select Services & Products > Library Services > Processing & Cataloging. Click on the link to the online form. Once specifications are sent to us, they will be used to process all orders unless we are instructed otherwise. Changes can be made to specifications on file by letting us know what you would like to change/add. We will then make adjustments to your account. If you would like different processing or cataloging for an order, please contact our Customer Service Department at 800.245.9540 or customerservice@mackin.com. To fill out a paper copy and mail or fax it back to Mackin, click on our downloadable PDF file. Once we have your custom requirements on file, they will be used for your orders.